The simplest definition of medical malpractice is “a careless or intentional act committed by a healthcare provider that leads to injury or death.” When a doctor, nurse, or other medical professional fails to deliver the care they have pledged to provide, their negligence can irrevocably alter the lives of their victims and the victims’ families. No one should ever have to suffer at the hands of the people they trust. When someone dies or is severely injured while under the care of a medical professional, the situation may be written off by the healthcare provider as something that was out of their hands or could not have been prevented. 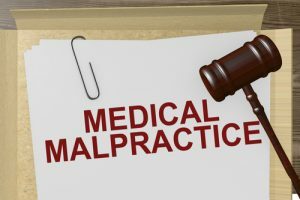 Medical negligence or medical malpractice can sometimes be tricky to identify, but it is always wise to question whether or not what you experienced qualifies as malpractice. Sometimes, having a long-established relationship with a doctor may make you reluctant to believe that this trusted professional could have provided anything but high-quality care. People do make mistakes, but accountability must always be in place, especially when it comes to life and death. Doctors and nurses know what is expected of them and what critical jobs they have. Every step of protocol must be followed, every exam carried out a certain way, every surgery conducted as described, every emergency handled with the best possible care, every medication carefully considered before it is prescribed. Delayed Diagnosis or Misdiagnosis: It’s malpractice to not diagnose a traumatic brain injury, to neglect to notice a vital sign that signaled a bigger problem, to delay a cancer diagnosis which allows the disease to spread, or to overlook an infection that became septic. Any incorrect identification (or lack of identification) of a patient’s problem could lead to sub-par, inappropriate, or harmful treatments . Surgical Errors: When TV doctors, interns, and nurses screw up, it makes for good drama. But the medial mistakes made in real life come with serious real-world consequences. The operating room is a stressful environment filled with potential problems, from the poor administration of anesthesia to the surgery causing a problem that was not preexisting. Post-operative care can become medical malpractice if patients are mishandled, given incorrect medication, or provided with inadequate instructions for caring for themselves after surgery. Emergency Room Errors: Few places are more chaotic than the ER. Medical professionals who work in this environment do their jobs with adrenaline and quick-thinking, which makes it all to easy for them to be careless, act too quickly, misdiagnose, or mistreat a condition. Incorrect Treatment: Innovations in medicine save lives, but utilizing experimental treatments that have not been proven may constitute medical malpractice. Similarly, prescribing a known treatment but administering it improperly can also be grounds for a case. Medication Errors: When the wrong medication or wrong dosage was prescribed or administered, and the patient suffered an overdose or injury because of this mistake, it can be considered medical malpractice. A pharmacist’s error, such as mislabeled medicine, can also fall into this category. Failing to Explain Risk: Before any surgery or procedure, doctors are bound by law to warn patientd of any potential known risks to their health and life. If informed consent is not given by the patient but the treatment is administered anyway – especially with a negative outcome – the doctor may be liable for medical malpractice. Labor and Delivery Errors: Birth injuries like cerebral palsy can result when doctors and nurses are negligent in their care of a mother and her infant. If the child was harmed during delivery by the improper use of tools, decision-making delays that led to oxygen deprivation, or poor judgment, this negligence can fall under the category of medical malpractice. If you have experienced negligence at the hands of a trusted healthcare provider – including carelessness, distraction, lack of knowledge, lack of experience, or intentional harm – and that negligence resulted in injury, impairment, permanent handicap, or wrongful death, you should talk to a Michigan medical malpractice lawyer about your case. At Thurswell Law, we are not intimidated by hospitals, doctors, or insurance companies. We have decades of experience in managing medical malpractice cases and regularly consult with top physicians across the country. Trusted medical professionals have failed you, but we will not. It’s time for you to get the compensation you deserve for your pain, health problems, medical bills, emotional suffering, and the damage that has been done to you and your family. Contact Thurswell Law at (248) 354-2222 to schedule your free consultation.